Eric Ythier and Wilson Lourenco have recently published an article discussing the geographical distribution of the genus Teuthraustes Simon, 1878 (Chactidae) in Ecuador. 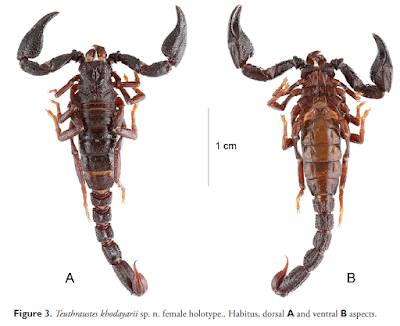 Three new species are described. Three new species of scorpions belonging to the genus Teuthraustes Simon, 1878 (Scorpiones: Chactidae) are described from the Amazonian and Pacific regions of Ecuador. The new descriptions raise to four the number of Teuthraustes species in Ecuadorian Amazonia and raise to two the number of species described from the Pacific region. The total number of species of Teuthraustes is now 27, including 15 in Ecuador. The geographical distribution of the genus in Ecuador is enlarged and its pattern of distribution in the country is also commented upon. Thanks to Eric Ythier for sending me the link to the article!